Ghana's second World Cup group qualifying match against the Bafana Bafana of South Africa. Boakye was one of many players the Stars handlers were hoping to line up against South Africa after Ghana's sluggish start in Burkina Faso where the team lost by a lone goal. The player's mentor and manager, Anthony Yeboah, himself once a dependable strike force for Ghana, yesterday told the Soccer Express that Boakye must return to his Germany base on Tuesday to receive treatment for his leg injury and has strict instructions from his club doctors not to kick the ball until the injury is taken care of. Boakye has only been passed to do some amount of jogging and light exercises 'but not to kick the ball', according to Yeboah, who said the player is at pains to miss the Stars game and would have loved to do battle for his nation. Asked if the injury excuse is not being feigned to let Boakye stay away from national assignment, Tony Yeboah said he does not see any need for Boakye, or any player to deny his nation of his little contribution and maintained that the player's injury is a genuine case.He said Boakye was given only a week to travel to Ghana and must return to treat the injury and get ready for the German season when it starts. 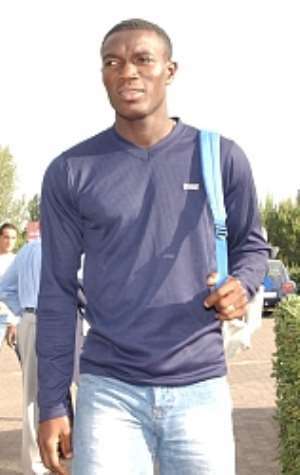 He was even issued with a covering letter explaining his condition.Yeboah was thus surprised to read in the newspapers that the injured player was wanted by the Stars handlers to feature for the team, pointing out that better rapport should be built between national team handlers and players to ensure constant interactions.He explained that Boakye is one player who will not hesitate at all to answer national calls, and while he was in the country before the Stars travelled to play the Stallions of Burkina Faso, the same injury situation ruled him out of that match. Yeboah said he had asked the player to visit the camp of the national team to show and explain himself to them to straighten up matters before unlikely meanings are read into his absence. He would however have wished that the reverse pertained, where the handlers would have visited him and found out what condition he is in before asking him to join the team. Kwadwo Poku, formerly of King Faisal, who is one of Coach Barreto's new invitees to the Stars camp, is however available and will join his colleagues today. On the phone from Kumasi, Poku who now plies his trade with Midtjyland in Denmark said he is on a month-long holiday and will be around well beyond the match date. He could not feature for his club in the Danish League, however he managed to score nine goals in five friendlies he played. His immediate desire, after the Stars match, is to secure a regular position in his team. The Black Stars technical team are also banking on a couple other strikers for the must-win encounter with South Africa on June 20, and the list includes Asamoah Gyan, Augustine Arhinful, Tanko Ibrahim and William Tiero.